The LAES Lab and Expressive Technology Workshop is available to all LAES students and is used as a collaboration space to work on interdisciplinary projects with other departments and programs on campus. Improvements are on-going and equipment is updated as our needs predict; our primary goal is to make this space a great place for designing, creating, testing, and updating expressive technology work that combines aspects of theater, cinema, music, dance, electronic design, computer science, and innovative sustainable technologies. The space is shared whenever possible in accordance with our mission as an interdisciplinary program. Students from the Colleges of Architecture, Liberal Arts, and Engineering have used our space for a variety of projects. The LAES Lab Managers oversee all equipment and activities in the lab. While the Lab Managers are able to assist with most projects, some have particular specialties. Please submit the appropriate equipment or activity request as described below. Some equipment (camcorders, cameras, recorders, microphones, etc.) can be checked-out for short periods to help with class or senior projects. (All students are required to submit an Off-Campus Authorization Form accepting responsibility for the equipment.) Fill out the LAES Equipment Request Form and a Lab Manager will contact you to coordinate check-out. Please provide a minimum of two-days notice (more during quarter breaks). Lab activities are also managed by the LAES Lab Managers. 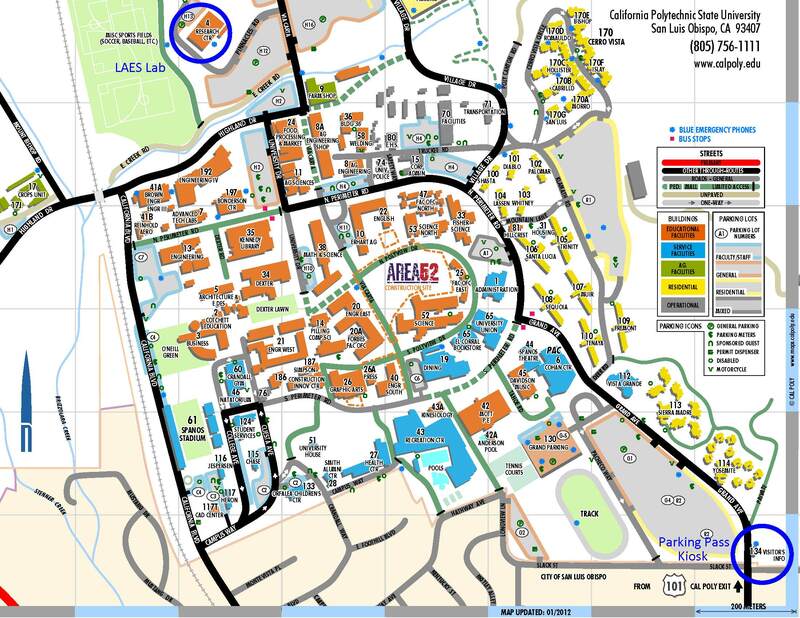 When you need lab access (other than to check-out equipment), send a request to laes-labrequest@calpoly.edu, indicating your specific need (please provide as much advance notice as possible). The LAES Lab is located in the Building 4 Research Center, in Room 105. Building 4 is near the sports fields and above the H12 parking lot. Parking is available in the H13 lot. Please note that both parking lots require a parking permit. View the map. The Liberal Arts & Engineering Studies degree is now a BS! Engineering and Art unite in LAES 301 project-based introductory course. The class is open to all second year and above Cal Poly majors and provides innovative hands-on work, in a team setting, for real-life projects. Contact us for a permission number. The LAES Club exists to bring together students interested in creative technologies, to collaborate on interdisciplinary projects and learn about and network with members of the industry. The program prepares students for a wide range of innovative careers in emerging professional fields that combine skills and interests in the technology, arts, and culture. Please help LAES continue to provide quality interdisciplinary education for our students. Your gifts will help foster this unique program and extend its impact by enabling more students to collaborate with each other and faculty, in innovative ways, in the area of expressive and emerging technologies.